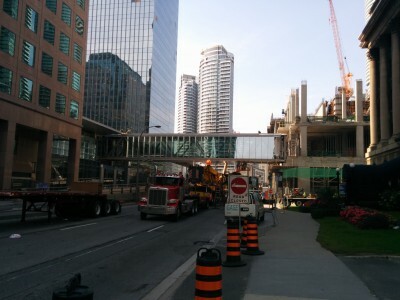 Yesterday witnessed the installation of the second of two shiny glass pedestrian bridge spans to extend PATH from Union Station to Queens Quay. 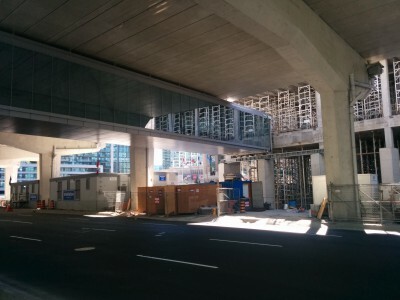 The first span, from the SW corner of ACC over Lakeshore, but under the Gardiner, to the NE corner of 1 York, which is under construction next to the now diminutive Harbour Commission building. The new PATH then runs south inside the East end of that building, and jumps again across Harbour Street to the north side of Waterpark Place, which is now all but complete, and thence inside that building to its south side and Queens Quay. This picture shows the second span going in yesterday morning. What I find quite marvelous about this is that it is above ground and has a view. 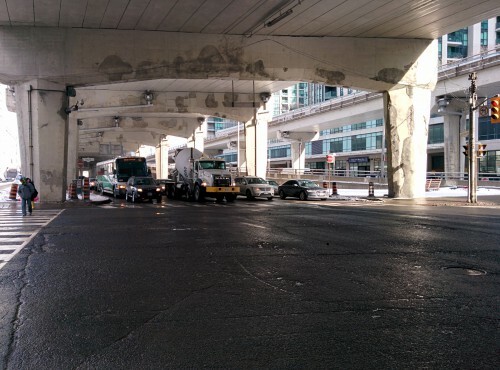 It snugs in just under the Gardiner, yet is well clear of Lakeshore traffic. To accommodate maintenance of the underside of the Gardiner deck, the span slides laterally out of the way. This new PATH route is not yet open to the public, but we might hope it will be soon. This picture shows the first span from ACC across under the Gardiner. I was never a fan of the underground PATH, rarely making use of it, in part because of there being no view, and also the lack of orientation to the streets above. Whereas I guide myself by the compass and streets, PATH’s chosen orientation was by bank tower and retail store names. So the elevated PATH is a joy that I will definitely use, and especially in the winter, when walking outdoors is problematic given poor snow clearing. Lakeshore Boulevard is a nightmare for pedestrians, which does not promise to go away. If I had my way I would close the Gardiner but leave it there and rename it Lakeshore Boulevard, then put all the current Lakeshore traffic up there, then convert the ground level into a human scale space, free of the danger, noise and pollution. A dream yes, but alas, not likely. What is likely is closing and removing the Gardiner, and somehow squeezing all those lanes of horrible dangerous fast hostile traffic into a new version of Lakeshore Boulevard, the photo-shopped images of which exclude trucks, whereas in fact they would be more numerous than now. This picture shows the horror of Lakeshore traffic. But given the horror that crossing Lakeshore/Harbour is for a pedestrian, the PATH bridge conjours new ideas, namely adding more such bridges to provide pedestrians, residents, commuters and visitors, with safe and comfortable alternative ways of getting about. Imagine, from the southerly exits of the Bay Street Teamways (under the station), pedestrian ramps or stairs rise gently southwards and curve toward the centre of Bay Street, and tuck under the Gardiner, and on beyond Harbour Street, and then descend toward Queens Quay, or continue on to connect with the Island Ferry Terminal. All that traffic horror left underneath.